Former PM at Jerusalem Post conference: If Israel makes peace with the PA, there will immediately be peace with 10 Arab countries. 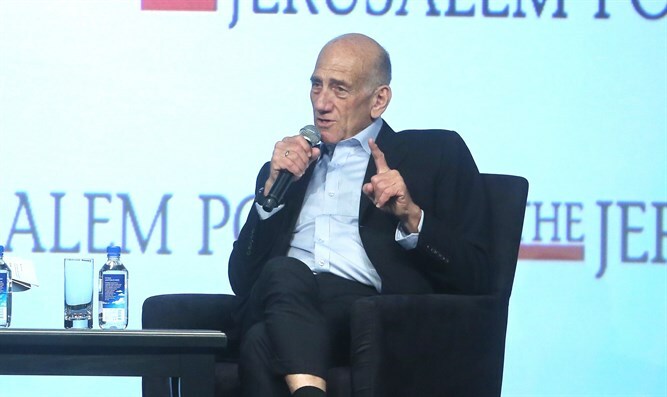 Former Prime Minister Ehud Olmert spoke on Sunday at the Jerusalem Post conference in New York and discussed, among other things, the Israeli strike on the nuclear reactor in Syria which took place during his time in office in 2008. "What we did with Syria cannot be done with Iran. Syria is relatively close, there was one structure, one nuclear reactor and that was the whole thing. When it was destroyed, their entire nuclear capabilities were destroyed until they decide to build a new one and that will take years,” he said. "When I was prime minister, Israel did a lot of unusual things by any standard, that you will not hear about for many years, in order to ensure we were not under the threat of a nuclear Iran," said the former prime minister. "They see Israel's potential and power and many of them want to be part of a Middle East that Israel is leading, but they are waiting for a peace agreement with the Palestinians for that. They will not accept open relations with Israel without an agreement. Therefore, an agreement between us and the Palestinians is necessary not only to create stability between us and our neighbors, but also to achieve significant economic and political progress," he continued.